Directions (1 – 10): In the following passage, there are ten blanks which are numbered with a word along with it and 4 words in options against it. 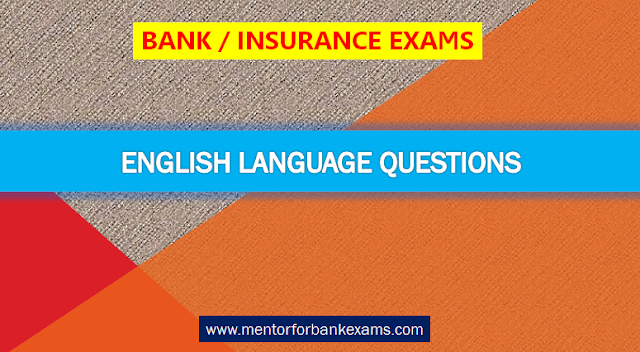 Choose a word which fits the blank the best, if the word along the blank is correct choose (E) ‘No correction required’ as your answer. There lived a turtle called Kambugriva in a lake, who had two swans as her good friends. All three of them would meet on the _____1 (banks)_____ of the lake every day, and _____2 (interacted)_____ stories, before returning at sunset. They enjoyed each other's company. One year, there was no rain and lake started to dry up. The swans got worried about the _____3 (below)_____ water level of the lake, and said to the turtle, "You will not be able to _____4 (float)_____ in this lake. All the water in the lake will soon dry up". The turtle was aware of the problem, "It is indeed difficult to live here anymore. Dear friends, please look for an _____5 (splendid)_____ lake, which is full of water. Then, find a strong stick from somewhere." The turtle continued, "Once you find another lake, you can carry me to the lake with a stick. I can hold the stick tightly with my mouth, while both of you can hold the stick at _____6 (additional)_____ ends and fly". As planned, the swans flew to distant places and after some time found a lake which had plenty of water in it. They returned to carry the turtle. They prepared to hold the stick from both the ends, and _____7 (indicated)_____ the turtle, "Dear friend, everything seems fine. But make sure to keep your mouth tightly shut all the time. You must not speak, or you will fall off." Finally, they started flying. After some time, they had flown some distance when the turtle saw a town below. The people of the town were staring at the sight of two swans carrying a turtle in the sky. "Look at that! This is a _____8 (usual)_____ sight that two birds are carrying a turtle with the help of a stick", they shouted in _____9 (admiration)_____. On hearing all the commotion, the turtle opened her mouth, "What is all the commotion about? ", she asked. Needless to say, she went down the moment she opened her mouth, and the swans could do nothing to stop her from falling down to the earth. As she fell down, the people of the town captured her to make a _____10 (moral)_____ out of her. The wise indeed say: Never fail to listen to the advice of your friends. The passage is about the turtle, who seek help from her fellow swans friend in order to find a new place for him to shift with plenty of lake water. The first paragraph talks about ‘Kambugriva’ the turtle and her swan friends who use to meet at the “banks” of the lake every day. “Banks” are the land alongside a river or lake. “Sides” and “water” would not be appropriate for the sentence. “Fringes” are ‘an ornamental border of threads left loose or formed into tassels or twists’. “Sloping” of the lake cannot be used as an alternative to the word “banks”. The paragraph talks about the turtle and her swan friends who use to meet at the banks of the river everyday and shared/exchanged stories. “Exchanged” as per the sentence means ‘to give or receive one thing in place of another.’ “Formed” stories would mean to make up stories, which is not correct as pee the passage. “Submit” and “Interacted” would make the sentence incorrect. Whereas “Sharing” is in the present continuous form and we require a past form to make the sentence correct. The paragraph mentions the drying up of the lake water, where the turtle use to live, and thus would have threatened the life of the Kambugriva, the turtle. Following this, her swan friends got worried about the decreasing water level. “no rain” suggests the use of a word, which would mean lowering down or decrease. Option (d) is thus the correct word to be used in the sentence. “Contaminating” and “Deteriorating” would mean the decrease in the water quality whereas we require something to describe a decrease in the water level. “Suffering” and “Below” would make the sentence inappropriate. Due to the lowering water level of the lake, the swan got worried about the turtle and believed that he would not be able to live/survive in that situation. Thus they say to the turtle that "You will not be able to survive in this lake.” Only a word, which would mean to live or to stay alive would fit the blank well. Thus only option (a) is correct for the sentence. “Behest” means ‘a person's orders or command’, “Float” would be inappropriate as in the passage Kambugriva the turtle, needed the appropriate level of water to live not to float. “Grow” means “come into existence and develop” whereas in the sentence the author is talking about the life threatening situation for the turtle not a situation for him to grow. Thus when the turtles and her friends were worried about her survival in the continuously drying water, the turtle asked the swans to find an alternate lake for him to shift in. “Alternate” means another best possibility. The use of the article “an” suggests the use of a vowel after it, thus this eliminates option (a) and (e). Whereas “Exemplary” means ‘serving as a warning or deterrent’. “Effective” means “successful in producing a desired or intended result”, it would be incorrect to be used as an adjective with “lake”. The turtle didn’t want to face the life threatening situations thus he asked her swan friends to find an alternate lake and also to get a strong stick onto which he could hold on tight from her mouth and fly to the alternate lake. The stick was suppose to be held by the two swans from either sides. “Either” is a determiner, which means ‘both’. (in the sentence both sides of the stick). Only the word, which means both would fit the blank. “Withal” means ‘in in addition’. When the swans found a suitable lake to shift the turtle they came back and suggested/advised the turtle not to open her mount while she would be holding on to the stick as it would make him fall down on earth. “Suggested” means ‘to put forward for consideration.’ “supplemented” means ‘to add an extra element or amount to’, “assisted” means ‘to help’ which is not the case here as the swans were suggesting the turtle not helping him. “prepone” means ‘to bring (something) forward to an earlier date or time’ whereas “indicated” means ‘to point out’. When the swans were flying the turtle to a different location, they crossed a town where the people got amazed to see the “unusual” sight of the three friends. Thus the word, which would mean “unusual” or “rare” would fill the blank most appropriately. “exclusive” means ‘excluding or not admitting other things’, “spectacles” is ‘a pair of glasses’ which is a noun which is not required in the sentence. “flimsy” means ‘insubstantial and easily damaged’. “usual” won’t be used as it would make the sentence inappropriate. When the swans were flying the turtle to a different location, they crossed a town where the people got amazed to see the rare sight of friends trying to help another friend in an unusual manner. Seeing this sight the people started to shout in respect and warm approval. Thus anything, which would mean ‘to respect’ or ‘to be in awe’ can fill the blank. “mesmerizing” is a verb whereas a noun is required to fill the blank. “hope” and “subtleness” would make the sentence incorrect. “amazed” is in the past tense and thus cannot be used. When the turtle opened her mouth to speak she feel down on earth. A “feast” is a large meal, which was made out of turtle when she fell down and was captured by the people. Thus anything related to making a meal out of something would be the correct word to fit the blank. “Festival” is ‘a day or period of celebration’ (making a festival’ out of the turtle will be incorrect). “Statue” is ‘a carved or cast figure of a person or animal’ (to make a “statue”, “display” or moral out of the turtle would be incorrect).